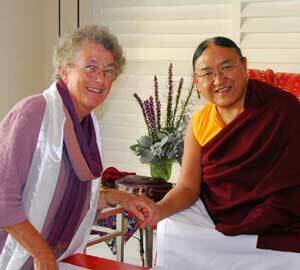 Jacqui's interview with HH Sakya Trizin, Sydney May 2009. My name is Jacqui Dodds, of East West Wisdoms, and I have the privilege of sitting here today with His Holiness, the forty-first throne holder of the Sakya Tradition, one of the four main schools of Tibetan Buddhism. H.H. Sakya Trizin is head of the Khon family, who introduced, consolidated and caused the spread of the teachings of the Buddha - from early days in Tibet and more recently in the West, travelling and teaching widely throughout the world, including India, Nepal, North America, Australia and many other Asian and European countries. He is respected as an emanation of Bodhisattva Manjushri and, in terms of Tibetan Buddhist protocol, he is considered second only to His Holines the Dalai Lama. His Holiness is in Sydney for the next five weeks in order to transmit the precious Lam Dre teaching of the Sakya tradition to the large group of students who have gathered here from all around Australia and all over the world. Your Holiness, it is indeed a very great and rare privilege to have the opportunity to speak with you. There are several questions that I would like to ask you that I hope will allow you to express some of your ideas on the similarity and differences between Buddhadharma - and psychological healing - as practiced in the West versus in countries such as Tibet, India and Nepal - where there is a longer tradition of Buddhist practice.